Whenever we visit Bled, we invariably don’t want to leave. Even the most cursory of glances at the fairy-tale lake shows why. Natural beauty cuddles up snugly next to its cultural counterpart, and we generally forget where we live, work and the rest. But what if you only had a day in this majestic spot? How to fit everything into 24 hours? Fear not, as your trusty Bled In Your Pocket team are on hand to condense a whole load of fun and beauty into one single day. 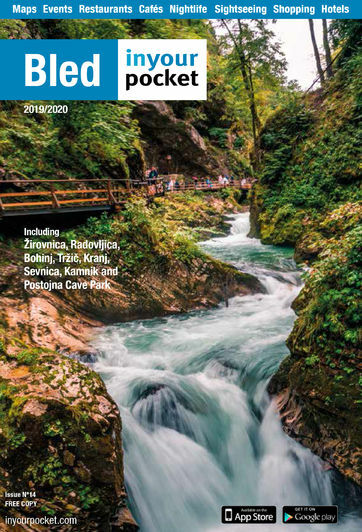 The best place to start without doubt is the new Triglav Rose Information Centre (Infocenter Triglavska roža Bled). As the name would suggest this is the place to head for information regarding the town, the lake and the surroundings (other than this very guide of course). 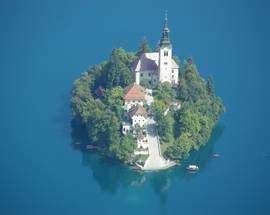 The permanent exhibition ‘Paradise at the Foot of Triglav’ is as must-see as exhibitions get, a veritable rabbit-hole of beauty and science. It’ll be very easy to lose track of time whilst here, so be careful. Pick yourself up a coffee from the lovely little café inside before heading towards the main attractions. 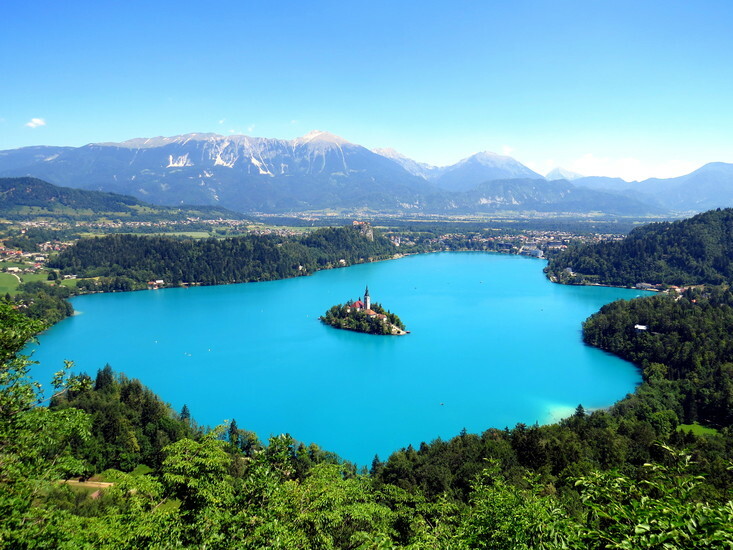 We all know what we’re here to see, and luckily the magical Lake Bled is just a short 10minute walk from the info centre. Once you’ve taken a moment to appreciate the glorious scene in front of you, it’s time to start the leisurely stroll around the lake. By stroll we obviously mean cycle, so rent some bikes and hit the saddle. You’ll need to build up some energy for the cycle, so be sure to get yourself some Bled Cream Cake, or Kremšnita, The cakes at Hotel Park are particularly delicious. Head back out onto the bike, and slowly trundle around the lake. Be sure to stop and take photos of the island from every possible angle. 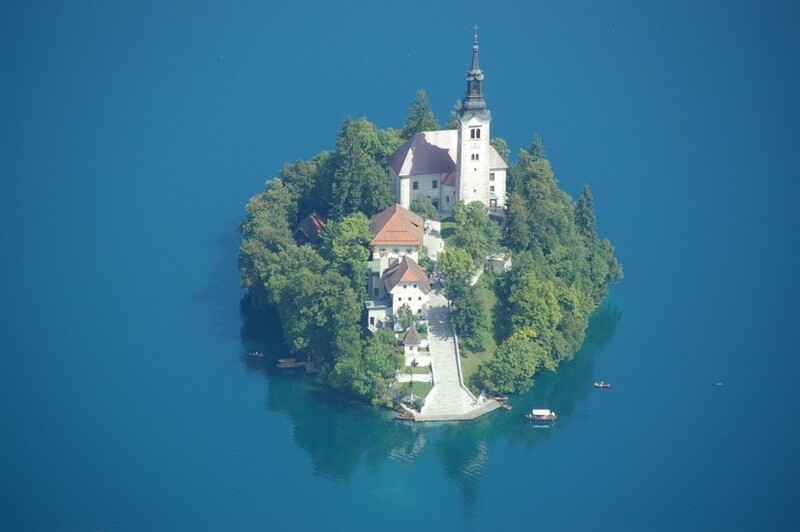 Bled Island is our next stop, and the best way to get out there is the romantic route, via a traditional Pletna Boat. Once on the island, offer to carry the lady of your affections up the 99 steps. If you managed this, your marriage will be blissfully happy. If you don’t, you might have to work hard to fix this mess. The Church of the Assumption is the most recognisable symbol of the island and if you ring the bell three times you’ll get some luck, if you believe in that kind of stuff. Also be sure to climb the Bell Tower and try some delicious Potica in the café before heading back to shore. Despite the desserts, the cycling, climbing and wife carrying should have brought you to an appetite by now, so this would be the perfect time to stop for lunch. The north-side of the lake has a number of interesting stops, but for those willing to spend a little bit more money we’d suggest making the most of the bicycles and eating at the Garden Village Restaurant. After lunch, the bike is the perfect mode of transport to head away from the heady, fast-paced (we’re not being serious) atmosphere of the lake and to see our favourite site outside. Just 6km away, Blejski Vintgar (Vintgar Gorge) is one of the most spectacular sights in the entire country. Formed during the last ice age, the gorge is full of rocky crags and water, and is another must-see to add to the list. After a breathtaking stop here, find yourself some breath to head back towards the lake. The day is getting a little long so the rest of the day should be spent relaxing, and where better to do so than Slovenia’s oldest castle? 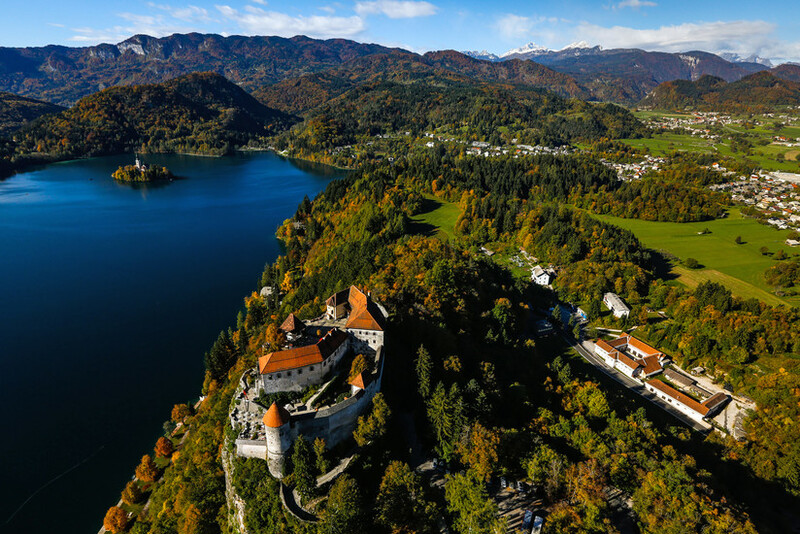 Bled Castle is everything we wanted a castle to be when we were young, sat dramatically above a stunning lake with jagged snow-capped mountains providing the most incredible of backdrops. The best views of the lake are truly found here so let them soak into every pore of your being. The castle is essentially an exhibition centre these days, so allow yourself the space and time to take it all in. 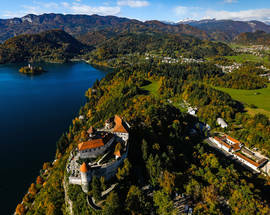 The sun is setting and its time for dinner, so where better than the Bled Castle Restaurant? As mentioned, the views from up here just can’t be bettered, and you’ll be forgiven for letting your food go cold as you gawp at the beauty in front of you. Try not to do this, as the cuisine is special in its own right. Day may have ended but the night is but young as they say, and luckily you don’t have to travel far for some excellent drinks. Grajska Plaža (Castle Beach) is found directly underneath the castle, and provides an excellent starting point for the evenings festivities. Head to Pub Lovec afterwards, for some of the finest beer in the country. There we have it! 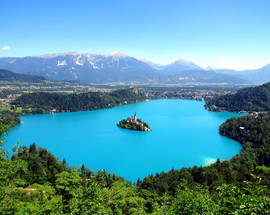 The best that Bled has to offer in one single day, via the energy-efficient mode of bicycle. What are you waiting for?